Calicut University has announced the updated allotment schedule of degree 2014 admission for various courses in the colleges affiliated to it. According to the notification published in the official website www.cuonline.ac.in/, the Provisional Rank List & Trial Allotment results will be declared on 19th June at 3 PM. Candidates who has applied for the courses can check the trial allotment status by logging in the official CAP(Centralized Allotments Process) portal of the University. The trial allotment will not ensure the student a seat in a college, but it would give him/her a clean picture about the selection process and also helps to know the chances of getting allotment for a course in a college. Applicants can rearrange the options from 19th – 21st June 2014, 5 PM. According to the procedure, after the period earmarked for revising options(19th – 21st June 2014, 5 PM), first allotment list will be published in the official website of the University. From the notification, is it known that the first allotment will be published on 23rd June at 3 PM. A supplementary list with least twice the number of candidates ranked in order for admission will be published afterwards to fill the vacancies of each quota. The 2nd allotment can be expected on 1st July while yet another allotment will be published on 8th July. The schedule of the 4th and 5th allotment following a notification would be declared later. 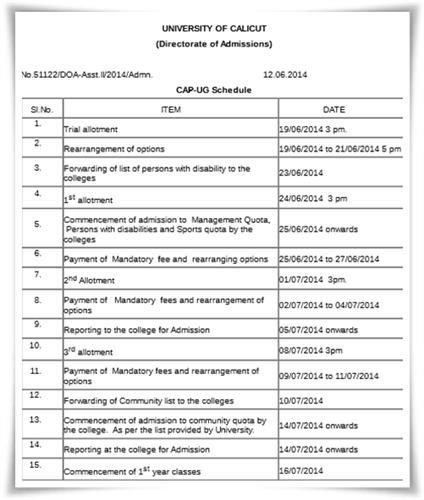 Sport admission for SC/ST candidates will be done at the office of Directorate of Admission, University of Calicut. The students who get admission have to report at the concerned college on 14th July 2014. The first year classes will commence on 16th July. The Centralized Admission Process is a revolutionary innovation which has proved to be blessing to students and parents. This unperturbed ingenious system guarantees transparency in admission. Students who have submitted online applications can check their allotment status through their UG CAP profile page by login with the application number and password.